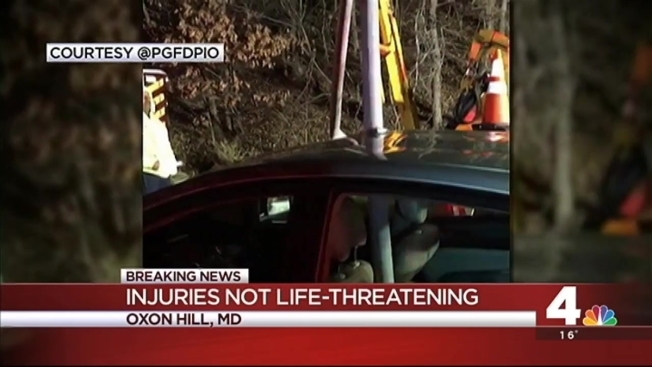 Two medics are hurt after a car sideswiped an ambulance on the Inner Loop of the Capital Beltway in Oxon Hill, Maryland. A car slammed into the ambulance on I-495 near St. Barnabas Road (MD 414), a Prince George's County fire department spokesman said about 9 p.m.
"[The ambulance] struck a small tree stump and hit a light pole before coming to rest with significant damage," Mark Brady of Prince George's Fire and EMS said. Two medics on board suffered non-life-threatening injuries and were in stable condition as of 10 p.m., officials said in an update. They were still hospitalized as of Tueday evening, officials said. No patients were in the ambulance at the time of the crash. The driver whose car hit the ambulance stopped about 200 yards from the crash scene, a fire department spokesman said in an update. Officials initially said she fled. The Inner Loop of the Beltway was closed near St. Barnabas Road but later reopened. No additional information on the cause of the crash was available immediately.